« Back on the net!!! Posted on December 28, 2007 under Linux. I’ve been wanting to catalog my entire book collection for quite some time now. I wanted to use something more than a spreadsheet for keeping track of my books. Somewhere down the line I had the grandiose idea of actually writing my own little catalog software, but all that went out of the window once I saw Delicious Library, the library cataloging software of the mac. Unfortunately, no amount of searching found me a good enough clone for the windows desktop (yes I still run a windows desktop). Sometime back, once I got openSUSE up and running, I began hunting for similar applications for openSUSE. After much hunting, I narrowed down on Tellico.Tellico is a fabulous application, however for some reason I couldn’t manage to get it running behind a proxy server. ( I suspect that my limited intelligence and the fact that I am running a gnome desktop had something to do with it.) Anyway, while searching I came across this application called GCstar, and thats when the search ended :-). 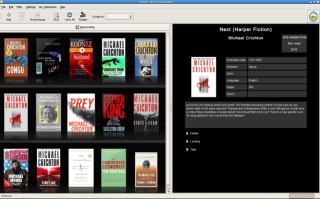 GCstar is a free open source application for managing your collections. Detailed information on each item can be automatically retrieved from the internet and you can store additional data, such as the location or who you’ve lent it to. You may also search and filter your collection by many criteria. This entry was tagged under: Linux, openSuse, Products, Software. Both comments and pings are currently closed. Good tool, I have like over 100GB of movies on DVDs and another 100GB on HDD. Everything is not organized so you can imagine the caos. GCstar is good, too bad it can’t scan dirs yet and the export templates seems limited. Well, it’s OSS for I’m confident the features will come in the future. Well there are a lot of other open source projects like CDCollect for gnome which let you scan directories. Yes, the export templates are limited. However since export to XML is possible and XML can be easily processed, I think third party tools that capitalize on this should be a possibility. In fact I am currently thinking of creating a tool to take XML output from GCStar and create PDF reports from it. About the PDF reports, it is a great idea. If you need some help about that, do not hesitate to contact me. Such a feature would be really great to include in a future release. The native format for GCstar is also XML. So you don’t even have to use an XML export before processing data. Sorry for this late reply. If you want to create an export plugin for GCstar, you should not need to do any gtk2-perl, but only some pure perl. I learned thanks to a book. But a web search with “perl tutorial” returns some resources that look really useful.